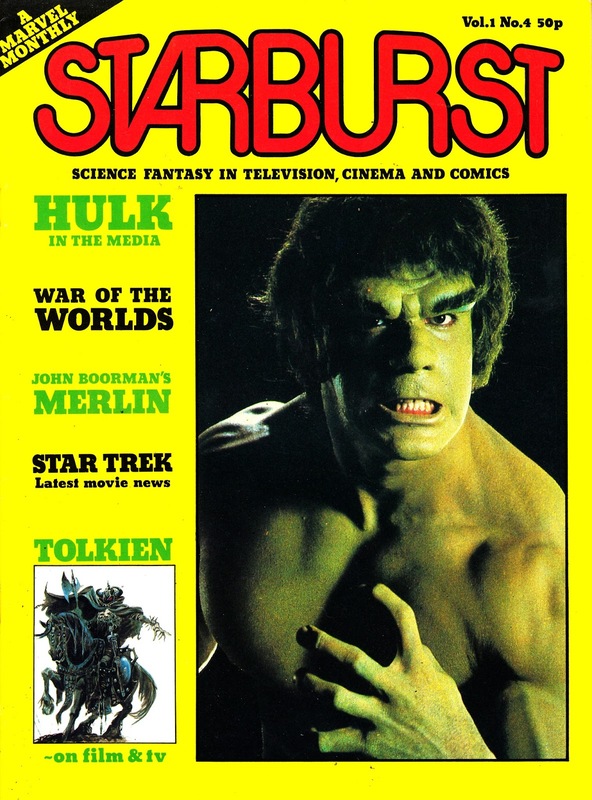 From 1978: The fourth issue of STARBURST magazine. Although it barely rates a mention inside, this was the first issue to be published by MARVEL UK. Head Office agreed to buy SB as well as the services of its editor/ publisher (Dez Skinn) as part of their plan to revitalize the struggling British branch (by shifting the day-to-day centre of power from New York to London and significantly bolstering the range). They clearly saw potential in a Marvel SF mag during the Star Age boom (although Marvel NY don't seem to have tried to distribute SB stateside in any quantities and didn't try and re-purpose the editorial material for a US edition) but passed on acquiring Skinn's HAMMER mag (then, after several name changes over two years, known as HALLS OF HAMMER), making the 23rd issue the finale (at least for a few years). This was the first issue to appear with the new, standardized, cover design for the UK monthlies... part of Skinn's much-hyped 'Marvel Revolution'. The new house style was adopted by all the UK monthlies and also used (surprisingly) on Marvel's US mags. Presumably the thought process was that it would allow copies from both ends of Stan's empire to crisscross the Atlantic and be virtually indistinguishable (save for the spellings and the small print) to buyers and the trade. The Green Goliath was, appropriately enough, the first cover star of the Marvel era. Skinn bowed out of Jadwin House (Marvel's new ramshackle British base) in 1980 but the Annex of Ideas continued to publish Starburst until they sold it (apparently for a song) to upstart Visual Imagination in 1988. The last Marvel issue was 87. Marvel used SB to build a line of magazines: the one-shot TV HEROES tried to replicate the SB formula as a general TV magazine in 1979. DOCTOR WHO (another Skinn launch) started to evolve into a magazine (partly because text is a lot cheaper to publish than comic strips) from 1980 onwards. The DWM formula was replicated for BLAKE'S SEVEN MONTHLY in 1981. CINEMA debuted as a one-shot in 1981 and returned (briefly) as a regular magazine the following year. The all-but-forgotten MONSTER MONTHLY also scared up a brief run in 1982. By the mid-Eighties, M-UK was retrenching as an extension of toy maker's marketing departments and a genre magazine was starting to look out-of-place in the portfolio. DWM endured thanks to still healthy sales (despite the declining fortunes of the show itself) and strong internal lobbying which saw the bigger benefit to the company of having a BBC-licensed title in the portfolio... and the access it gave them to BBC Enterprises. Starburst however was deemed surplus to requirements... and flogged-off on the cheap. Visual Imagination used their new acquisition as a springboard to grow a large range of genre mags throughout the nineties.